On a warm autumn morning in 2017, four young boys excitedly reach for irises in small pots and a chance to push their hands into soft dirt. One of the fourth graders laments his buddy is late and will miss out on planting the rain garden. “This is so much better than sitting in class!” he exclaims. As these young Kingswood Elementary School students are learning, this new rain garden on the school grounds does more than soak up rain water, reduce pollutants and improve the health of downstream Black Creek. It provides plants for our butterfly and bee pollinator friends, birds and amphibians. It provides a touchable, smell-able and dynamic outdoor learning environment for growing minds. Also, as we unexpectedly learned through conversations with teachers, tranquil planted spaces like these provide brief moments of respite for stressed teachers and other school staff. 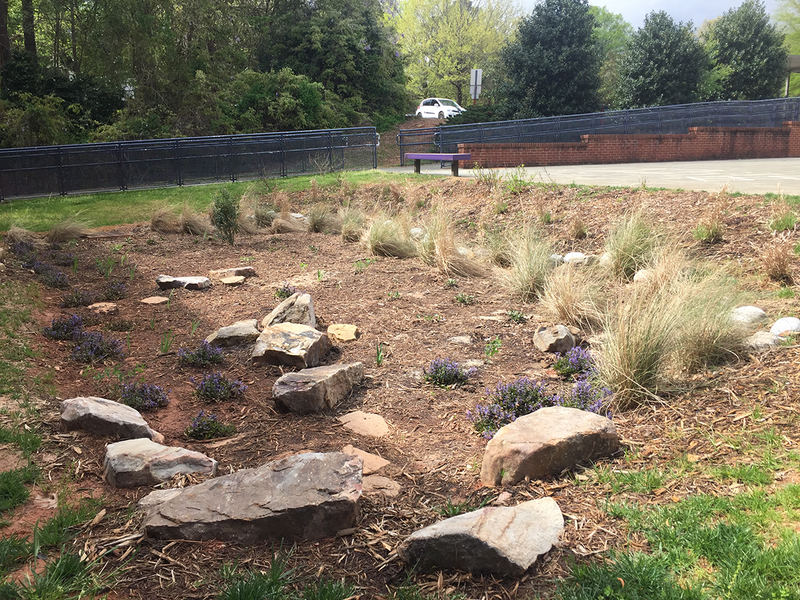 The impetus for the Kingswood Elementary School rain garden, cistern and native planting areas came from the also-stressed Black Creek, a modest but beloved urban stream in Cary, North Carolina. Black Creek flows from downtown Cary into the Crabtree Creek system and ultimately drains to the Neuse River Estuary and the Atlantic Ocean. The Black Creek Watershed Association (BCWA), which I coordinate as part of the missions of Water Resources Research Institute and North Carolina Sea Grant, has been working to reduce stormwater runoff impacts to the creek through green stormwater infrastructure, or projects that use nature to reduce runoff and pollution while benefiting people’s health and well-being. Think of the difference between gray infrastructure – such as a stormwater pipe hidden underground that sends untreated stormwater directly to a creek – and a rain garden, a below-grade garden that uses plants and soil to soak up water and pollution. A U.S. Environmental Protection Agency grant allowed partners to design, install and provide educational opportunities for students around green infrastructure at the school as part of a larger initiative to improve the health of Black Creek. A Kingswood Elementary parent and student dig holes for native plants in the school’s rain garden in the fall of 2017. The rain garden begins to awaken after the winter. Half a year after the planting, the rain garden plants are established and create a haven for students and teachers. Knowing that teachers are pressed for time to meet educational standards and ready students for tests, the BCWA asked how we could meaningfully engage teachers and students so they would be comfortable using outdoor spaces. Kingswood Elementary principal Sherry Schliesser and assistant principal Barbara Fair already knew the benefits of outdoor learning spaces – the student Garden Club was growing edible plants in raised beds and in a greenhouse built on the school grounds by a local Rotary Club – so they already had some ideas and suggestions. They recommended involving their contact Randy Senzig of the education nonprofit Center for Human and Earth Restoration (CHER), in the grant proposal. 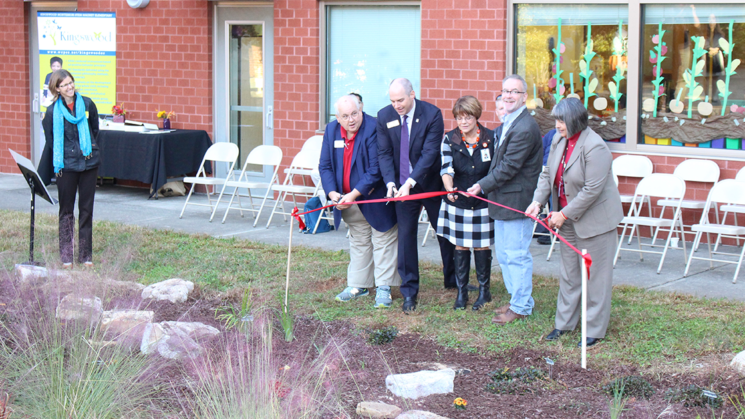 Senzig brought teachers and their classes outdoors throughout 2017 and 2018, guiding students through activities to explore the natural features of the school campus and to choose a location for a possible rain garden. After learning how rainwater flows across their campus, students chose the grassy area downhill of the basketball court as an ideal spot. Unbeknownst to them, the adult professionals had selected that very spot as our priority area, too. Shortly after receiving the grant in 2016, the BCWA team had held two meetings to explore opportunities and needs on the campus. These meetings brought together school administration and teachers, Wake County Public School System Facilities staff and Town of Cary Stormwater staff. They joined a team including engineering expert Sarah Waickowski of North Carolina State University’s Department of Biological and Agricultural Engineering, landscape architecture and early childhood development expert Carla DeCambre of NC State’s College of Design’s Natural Learning Initiative, Senzig and the Kingswood community. The team chose two spaces: the highly visible location suggested by students for a bioretention area – a large, engineered rain garden – and the area next to the media center and greenhouse for a rainwater-harvesting cistern and a few rows of native plants. DeCambre assigned her spring 2017 semester College of Design graduate student class to create designs for the two areas. To kick off the design process, the graduate students visited the school and chatted with children about what they did outside and how they felt about the outdoors. DeCambre and her team heard a fear to touch things outdoors – would the children hurt something, or themselves? In a time when screens command attention from all sides, many kids have few opportunities to interact with nature. Thus, engaging youth with natural spaces requires an intentional approach. The Design students’ plans were beautiful and innovative – and ran the gamut from ready-to-implement to ahead of their time. The BCWA team displayed the six most viable plans at a teachers’ meeting and at the annual spring STEM Fair. 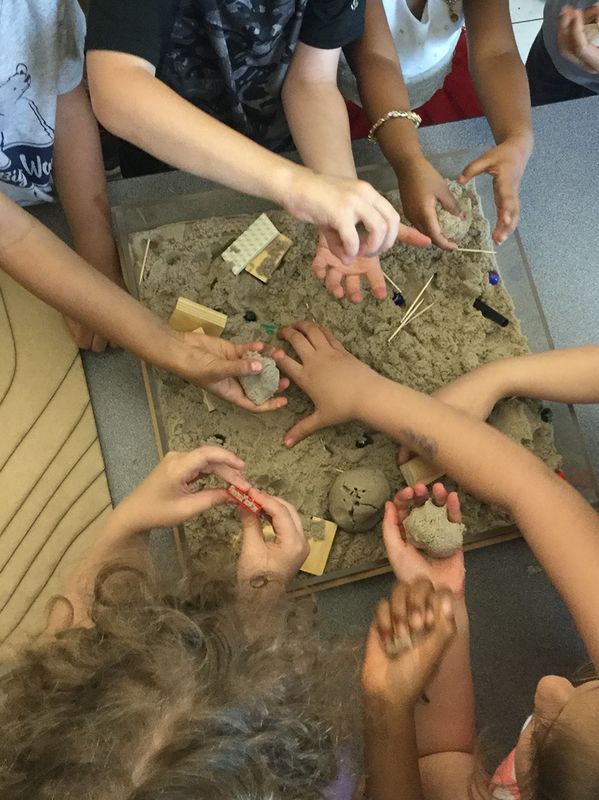 Older students and parents wrote what they liked about the designs on sticky notes, while DeCambre’s interactive kinetic-sand watershed model engaged the younger children. Parents wanted as many native plants as possible. The concept of decorative grasses planted en masse was very popular with all, as was the idea of incorporating art. DeCambre took the students’ and parents’ feedback into account and created a beautiful planting plan that almost exclusively utilized native plants. The strip of land where the cistern was planned was already landscaped – with the non-native shrub inaptly named “heavenly bamboo,” or nandina, which is not so heavenly to birds that may eat its toxic berries. Nandina’s berries are known to kill cedar waxwings, who tend to descend in large groups and gorge on available berries to fuel their migration. The nandina had to go. Young children play with sand in a watershed model at the Spring STEM Fair at Kingswood Elementary School. The preparation work for the bioretention construction and cistern area, including nandina removal and disposal, was put out for bids from contractors in early summer 2017 and we selected Vortex Drainage Systems, who had the experience and reasonable price we needed. We were ready to go, with a goal to do the excavation and move heavy equipment offsite before school started in August 2017. A moment of panic ensued when the first day of school saw the rain garden still undergoing construction, complete with a giant pile of bioretention sand next to the car pool lane. But Kingswood staff were not deterred – yellow tape went up and Principal Schliesser stood nearby directing parents around it. The contractor’s staff stood on the sidewalk watching out for students migrating between buildings, stopping their equipment to let them pass. That fall, Mitch Woodward, the Area Natural Resources Agent for NC State’s Cooperative Extension, installed a 2,100-gallon cistern, after several of us on the team put our backs into rolling it across campus to get it into place. He installed a top-of-the-line submersible pump, to minimize chances of malfunction, and a yard spigot for attaching a hose or filling watering cans we provided. An electrician recommended by Wake County Public Schools installed an outdoor outlet for the pump. To ensure that the cistern functions as a stormwater-reduction device, Woodward installed an overflow valve that will slowly drip the top third of the tank through the landscaped area into an existing storm drain. Even if the school forgets to use the cistern, it will slowly drain, making space for more rain. Before work began, non-native nandina grew in what would become the cistern garden. Native plants take hold next to the newly installed cistern. With the heavy lifting done, the fun part of bringing in plants began. With over 250 plants – 84% native – to install, we needed many hands. Our 4th-grade Kingswood Elementary friends kicked off the planting in the fall of 2017 with help from the CHER staff. They installed plants in the bed of the rain garden, where the bioretention soil mix was soft and sandy. They installed irises, milkweed, Black-Eyed Susans and ajuga, the one non-native ground cover. Parents and BCWA volunteers planted during the school’s STEM Saturday, NC State graduate students relished a sunny afternoon away from their computers planting, and WRRI and North Carolina Sea Grant staff pitched in to help. People love to dig in the dirt and experience plants, though we tested their resolve with the difficult task of planting on the upward slopes and nearby areas of the rain garden – the soil there was mostly compacted clay with some gravel left over from school construction. To encourage students to get into and close to the rain garden, while protecting the soil from compaction, we visited a stone supplier and ordered a pallet of small boulders. One afternoon in December, graduate students and BCWA volunteers, moved boulders into place with a wheelbarrow, shovels and muscle-power. Our resident BCWA horticulture expert and long-time volunteer with the JC Raulston Arboretum, Carol Lawrence, guided us in installing boulders with the important advice to carefully dig holes for them, so they remain stable when small feet step on them. Deliberate placement also prevented the boulders from looking as though they dropped from space. Finally, the student Garden Club helped to install plant markers and the BCWA team provided simple, educational signs for both the cistern and rain garden. Wake County School System superintendent Cathy Moore addresses teachers, students and guests at the green infrastructure celebration on Oct. 31., reminding them how the rain garden and cistern offer lessons not only on ecology, but also on teamwork. We extended the grant through December 2018 to provide plenty of time after installation to ensure proper functioning and plant survival, and to engage a second year of classes in outdoor educational activities. 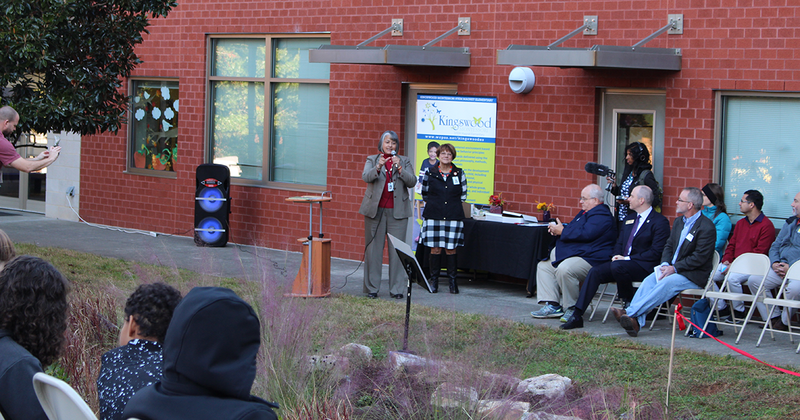 As the grant project approached closure, we held a celebration and dedication on Oct. 31 of what we called Kingswood Elementary School’s “Outdoor Learning and Stream Protection Areas”. Ms. Danielle Scheren’s 5th grade class performed a skit at the rain garden that shared what the rain garden provided for their school- habitat for wildlife, beauty for the school, absorption of stormwater and many more benefits. In the audience were 65 4th and 5th grade students, and adult guests that included Wake County Commissioner Greg Ford, Wake County School Board member Bill Fletcher, Cary Town Council Member Don Frantz and Wake County School System’s Superintendent, Cathy Moore. Our guest dignitaries also spoke with students about the benefits of green infrastructure and the process that made it happen, including collaboration and making ideas come to life. They stressed that any person can have an idea, find partners and make it happen together. 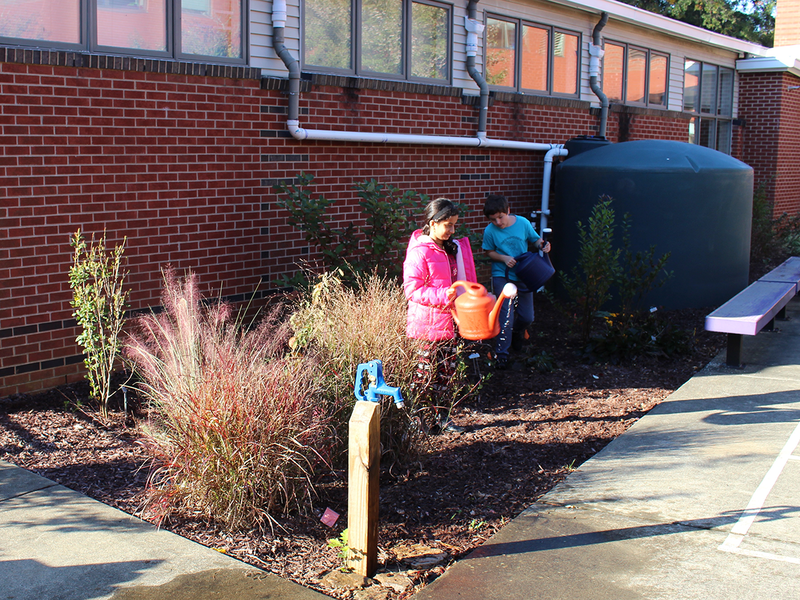 WUNC Radio and Cary Magazine reported on the event, bringing some helpful public exposure to the topics of green stormwater infrastructure and outdoor learning at schools. 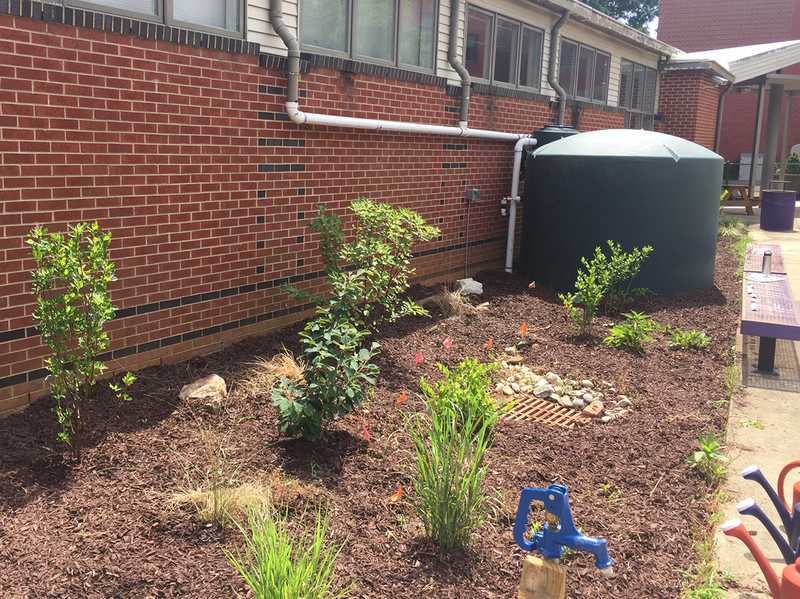 The BCWA has installed green stormwater infrastructure at schools before and we are aware of the challenges to WCPSS and schools of continual maintenance. Ideally, a third-party would have the singular responsibility of working with schools to refresh mulch and care for plants a few times per year, as well as engage classes in using the areas. 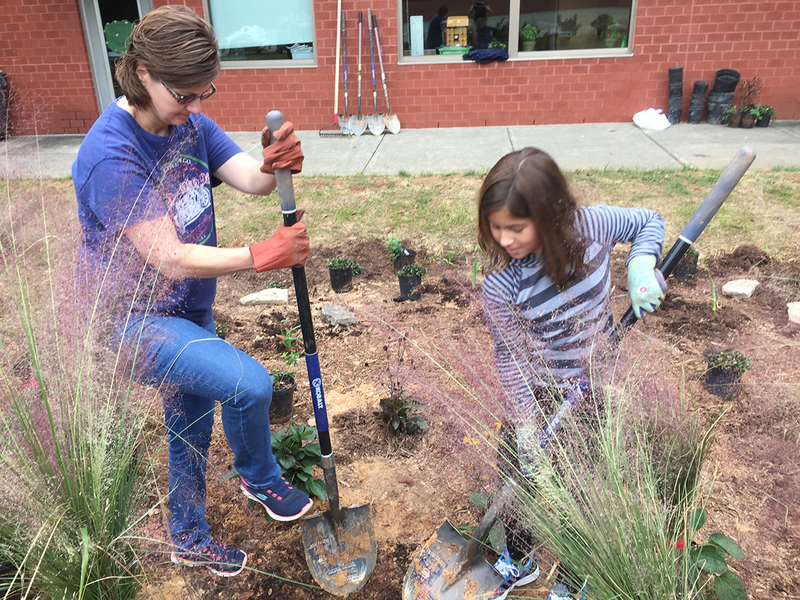 Recent upkeep of an eight-year-old rain garden at nearby West Cary Middle School only cost $500, coordination time and two volunteer events to spread mulch and install new plants. If you build it and provide service opportunities, volunteers will come. The challenge of finding and supporting this “maintenance angel” remains. The benefits to teachers’ and students’ well-being and development, in addition to the reduced pollutant and flooding impacts on the ecosystem and downstream communities, can outweigh the modest costs to maintain green infrastructure and keep it functioning as the school amenity it should be. 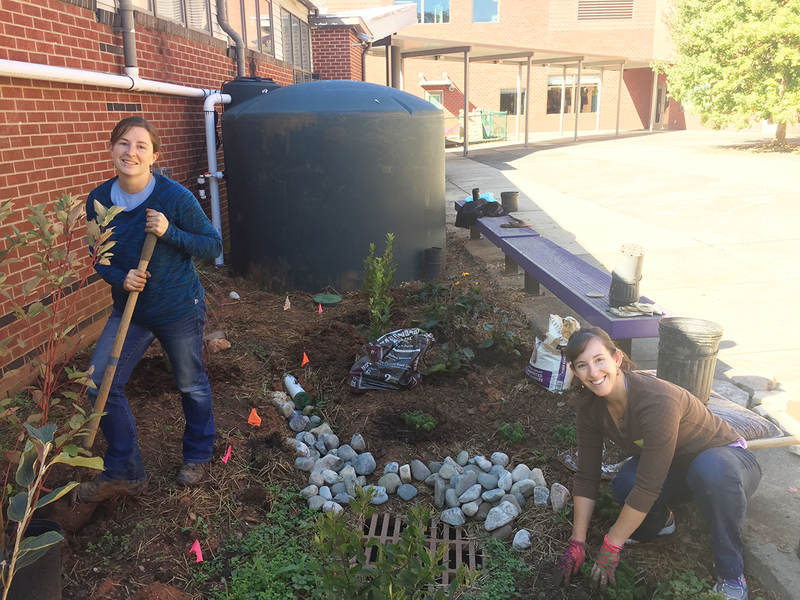 North Carolina Sea Grant’s Jane Harrison and Anna Martin of Sea Grant and WRRI get their hands dirty as volunteers, helping plant native plants in 2017 to absorb water from the Kingswood Elementary School rainwater cistern. 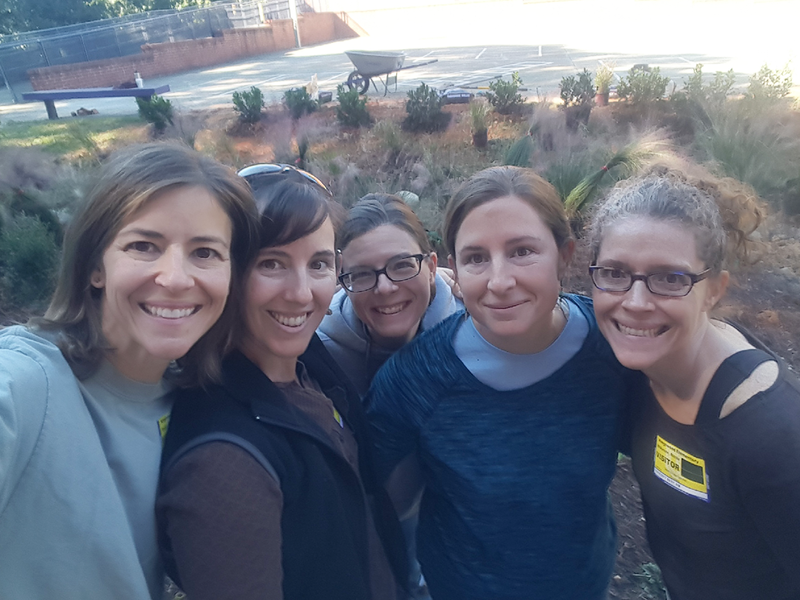 WRRI and North Carolina Sea Grant staff pitch in to help plant the Kingswood Elementary School rain garden in 2017. Left to right, Christy Perrin, Anna Martin, Jessica Whitehead, Jane Harrison and Nicole Wilkinson McIntosh. For those thinking of installing green infrastructure with schools like the Kingswood Elementary features, I advise you to consider the following lessons that we learned. Engaging a broad range of parties – teachers and school system staff, parents, students, engineers, landscape architects, horticulturists – early and continuing to check in with them throughout the process are some of the most important aspects of planning a successful project. Each person brings a different and needed perspective that together result in engaging, functional and beautiful results. Battling erosion and supporting plants is a constant challenge with rain gardens, as they are designed to bring large quantities of stormwater into the area and soak it up. In the Kingswood Elementary garden, dispersed stormwater from the basketball court flows across a short, but steep, slope into the rain garden. The first rainfall after excavation highlighted weak points – such as places where runoff from the basketball court concentrated into streams underneath a coir (coconut fiber) mat meant to keep the bank’s soil in place as grass grew. An approaching tropical storm set off a scramble to dig the resulting clay out of the bed, since clay will clog a rain garden, then buy and position sand bags to prevent further erosion. Along with the stepping boulders, we ordered several smaller rocks to dissipate energy along those flow paths. We planted switchgrass in bunches around the paths as well, since their root masses will grow thick and deep, holding the bank together. Often the slopes of rain gardens are left as compacted clay. While this can provide a solid structure around the rain garden, it can also make for a tough planting environment. Providing some amendment to the clay banks would make for easier planting and better plant success, although this would mean removing more soil and spreading it elsewhere. Water runs quickly off clay banks, meaning even the most drought-tolerant plants may have trouble getting established, if not intentionally watered deeply and regularly. This is a likely scenario at a school where the main focus must always be student success. Rain gardens will always lie further down the priority list. Plan flexibility in timing and budget for tweaking the rain garden during and after installation. The minor erosion issues in the Kingswood Elementary rain garden required the unplanned purchase of sand bags and rocks. Not all plants will survive, particularly if planted before a hot and dry North Carolina summer. Observing which plants do well over a growing season and replacing the dead ones is often necessary for keeping a rain garden full and beautiful. Schools will not often have resources to do this on their own. Finally, regular and continued maintenance is likely a major concern around school green infrastructure and natural learning spaces, whether that be rain gardens, cisterns or edible gardens. It is a valid concern, as school system budgets are tight as drums, with little wiggle room for adding to landscape maintenance costs. Also, contractors hired for standard landscaping often use a simple plan – add mulch here, spray weed killer on weeds, mow grass and trim the edges with a gas-powered trimmer. Taking on maintenance separate from this process may be challenging, but can ultimately be beneficial for supporting the beauty and integrity of outdoor learning spaces. In Wake County and many other school systems in North Carolina, the school community itself is responsible for demonstrating it will maintain these areas before they get approval, and then must deliver on its commitments. Success varies, as the school staff who champion these projects leave for new jobs and students and parents move on through the education system. I have seen rain gardens installed at schools in the past languish, with unplanned trees and shrubs taking root and crowding out everything else. Hopefully, the high involvement of Kingswood Elementary has planted the seeds for long-term care. 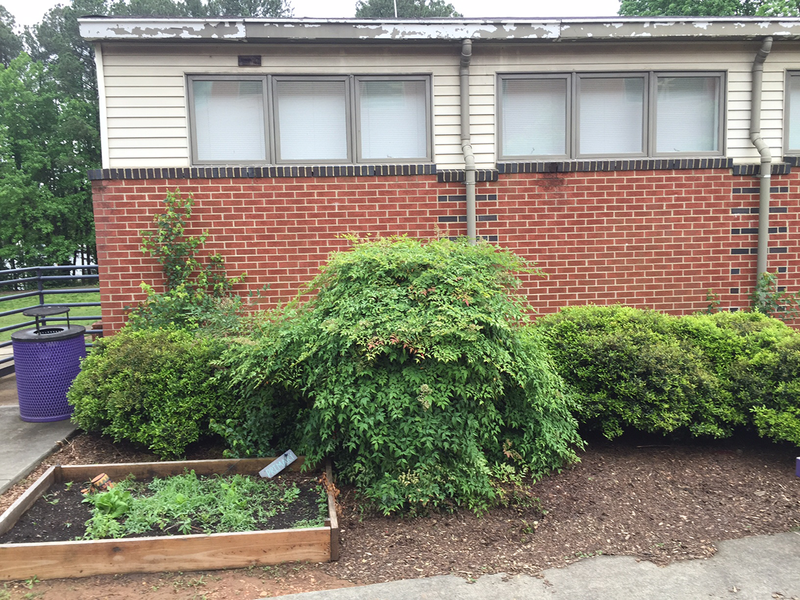 The school’s staff members have demonstrated their willingness and ability to keep up their green infrastructure, already adding mulch when needed and engaging the custodian in watering and care. External support could ensure this continues over time, particularly when administration changes in the future. A small investment in this centralized type of activity may be key to long-term success for green infrastructure at schools. Fifth graders Prabina Adhikari (left) and Noah Townsan use water collected by the new rainwater harvesting system to water the native plants.